Both of them are merged. The HXT900, a smaller but widely used servo (I use them a lot in my rc planes). Hi, I would like to contribute to the Freecad-Library. I'm already contributing in another library and could like to share some of these designs here. I thought could start with some electronic components. Welcome here! I've already seen your FreeCAD parts on G+. The best way would be for you to git pull the FreeCAD-library, copy your components to it and make a pull request. I can merge pull requests from GitHub's online UI with a simple click of a button. As for Electrical VS Electronics Parts, I'll admit I'm stomped; is the distinction important? 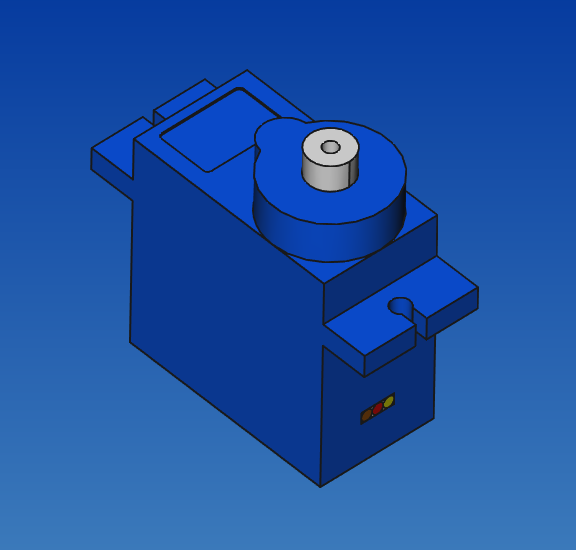 We already have servos in the Electrical Parts folder. But I don't mind if we change that and have two separate folders! I put the folder in Electrical part and I made a pull request. I would like to have write access to the freecad parts library if possible. I am planning to contribute more to this library and encourage the spanish community to do so. There are many spanish people who do not speaks english, but they are eager to contribute. I can help them a lot. I don't own that repo, Yorik does, so he's the only one who can give you write access. I know! I merged all of them! And sorry for not thinking of asking Yorik. I just added you as a collaborator to the repo, Obijuan! You should now be able to commit to it directly. Thanks already for all you did there so far!